Relatively big names were shut out of the early lead. Brent Bradshaw found the right line and held off the charge of Mike Papola and Tracy Jordan and Cody Waggoner to take the early lead going into A2. Scores were tight around this obstacle and the margin from 1st to 14th was just 19 points. Teams began to discover what was at hand for them all weekend when the tight course produced close competition. It also showed the teams that if they wanted to make it into the shootout they needed to be on their "A" game because one mistake could send them straight to the back. It became very apparent that this was not going to be any easy weekend for any of the teams. Brent Bradshaw came into this obstacle as the leader, but a run of 15 would knock him off the post and would hand the lead over to, Cody Waggoner, who along with Jason Scherer ran an astonishing score of 1 point. Waggoner and Scherer were running just 1 point apart and looked to be engaged into a battle for the lead that was just about as close as it could be. While some teams were taking care of business, others were caught without a clue. Troy Vickery, Kurt McLaughlin, Bill Kreisel and James Pearson were really off the pace of their competition and were struggling to keep up. Jason Scherer and Cody Waggoner were engaged into a battle for the lead coming in to A3, but when they left their battle was WHITE HOT! 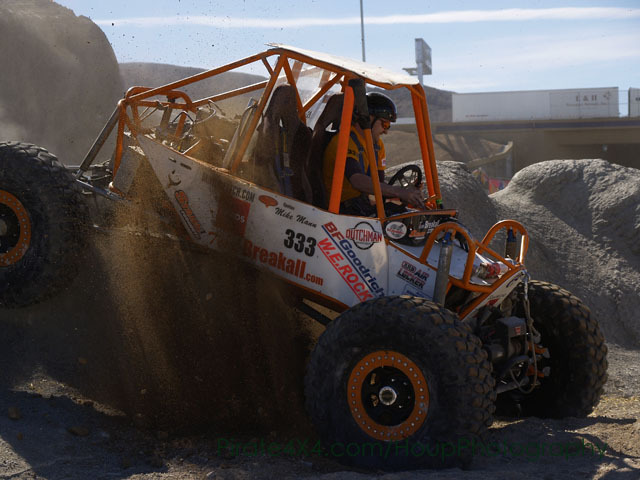 These two very talented rockcrawlers were sitting at just 13 points each and neither one wanted to give an inch to the other on the course and in the score sheets. These two were gradually pulling away from the rest of their competition. Tracy Jordan has just been biding his time in 3rd place, but has been losing ground through the nickel and dime method. At the end of A2, Jordan, was just 7points from 1nd place Waggoner and at the end of A3 was 8 points away. Brent Bradshaw stopped the bleeding, but was also losing ground on the lead. To make things even worse for Bradshaw, he had two of the best rockcrawlers in the world on his tail. Jason Paulie and Marty Hart were determined to dig themselves up the order after starting out in 7th and 8th. At the end of A3 they were in 5th and 6th. Also making headway was, Australian Peter Antunac. A winner just last weekend at Barrydale's season opening, OzRock round, Peter started to find his groove on a type of course he is really not used to. 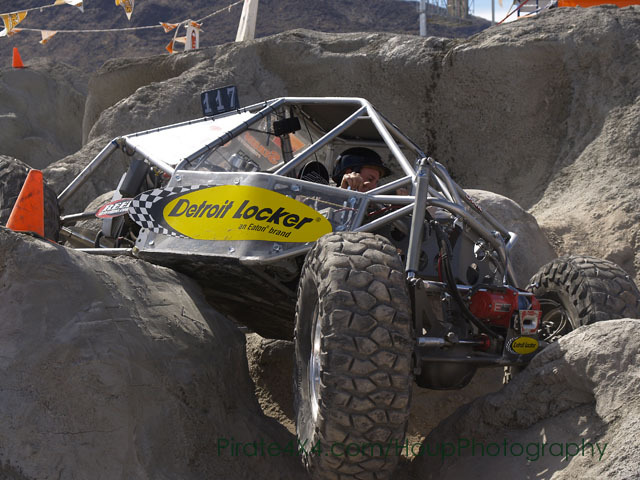 Cody Waggoner DNF's this obstacle handing over the lead to Jason Scherer. Waggoner would take a major hit in the points after a devastating 39 points. Tracy Jordan moved up to second, but gained no ground on Scherer and was still 8 points out of the lead. Marty Hart over took Jason Paulie as both drivers moved into the 3rd and 4th positions. Shannon Campbell and Peter Antunac also gained ground on the competition and moved into the 5th and 7th positions respectfully. Early leader Brent Bradshaw was way off the pace after his first DNF of the competition and would fall to 8th. Coming into today's competition the unlimited class is following in the footsteps of the 2006 series. 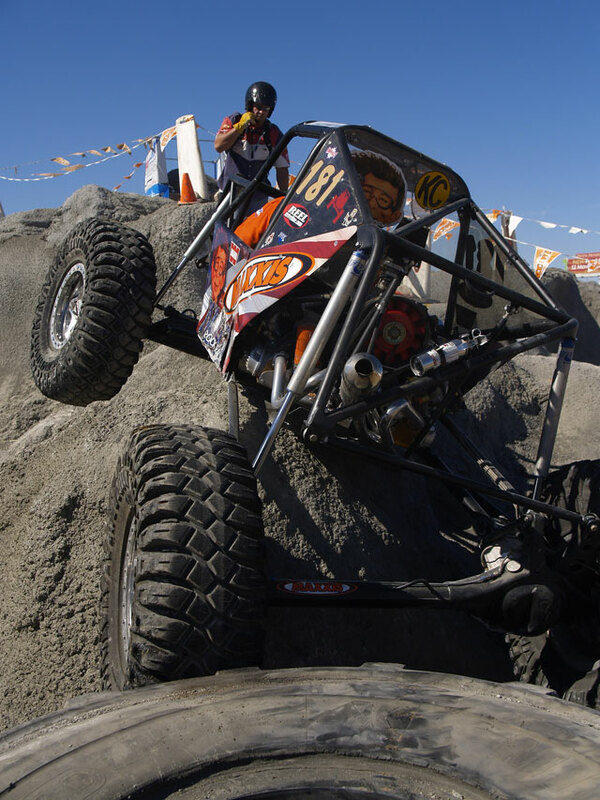 Jason Scherer and Cody Waggoner had been tied for the lead through 3 obstacles until Waggoner scored a painful DNF on A4. Scherer would find himself alone at the top when competition ended on Saturday. Hot on his heels was the man who took the win in Put Up or Shut Up, Tracy Jordan. The self described steel horse cowboy was keeping time with what Scherer was doing and found himself just 8 points being Scherer. Not far behind Jordan was the hired gun for this event, Marty Hart. The Ragin' Cajun is always a contender for the win in W.E.Rock Eastern National Competition, and is making the most of his run in Bruce Zeller's buggy this weekend. Currently Marty is 3rd, 15 points out of the lead. World Champion, Jason Paulie, has put another good day on the books. He may not be leading, but the champion is really in the cat bird seat. He is just 2 points behind, Marty Hart and 17 off the lead. 2006 Western National Series Champion, Shannon Campbell is in 5th place, after tougher run on A3 where Campbell took 19 points. Campbell is just 27 points out of first and 10 points off Jason Paulie. Cody Waggoner had been tied for the lead with Jason Scherer all day until a DNF on A4 sent him from 1st to 6th. He is 29 points out of the lead and will have to really play catch-up if he wants to make it to the podium. Jason Scherer held onto the lead after many teams took low scores. 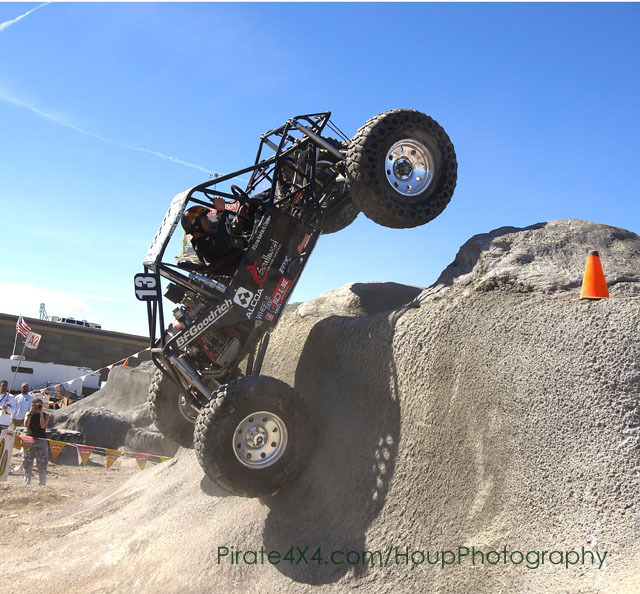 Jason Paulie set the low water mark at 2 points on this obstacle, but a war was on at the top of the standings. Many teams were locked in battles for positions. Scherer may have held a somewhat comfortable 8 point lead over Tracy Jordan, but second place was totally up for grabs as Jason Paulie and Marty Hart continued tag teamed their way up the standings and were within 10 points of Jordan. Cody Waggoner and Shannon Campbell were still in a battle over 5th, but an interesting battle was for 9th as 5 teams were within 11 points of each other. This event was starting to look like a NASCAR race instead of a rockcrawl with so many close battles all around the course. Jason Scherer blew it after taking 21 points on this obstacle. Tracy Jordan would inherit the lead for the event after Scherer stumbled. The race for the lead had just taken an interesting turn as it was now a three way fight between Jordan, Hart and Paulie with just two obstacles to go. Cody Waggoner and Shannon Campbell's battle was over after Waggoner ran 11 points on the obstacle. This would drop Waggoner below Peter Antunac, who would take over the sixth position by just one point. Antunac was starting to take advantage of a rig he admits to having little experience in on a type of course that is puts him out of his element. The question was with all of these major shakeups who would make the shootout? After much perseverance and a lot of catching up Marty Hart takes the lead late in the game after an amazing -12 point run. However there were many great runs had on B3. Including the run from early leader, Jason Scherer who's run of -6 put him in a prime position to challenge for a win. Going into the final obstacle the shootout field looked to be almost set after Cody Waggoner took a damaging 37 points. The separation between 6th (Antunac) and 7th (Williams) was exactly 40 points. There was still a barn burner of a battle between out of the shootout between positions 10-13. It is always interesting when 4 drivers are under 10 points apart battling for position. When the dust settled on Sunday's competition a highly competitive event was over and the six teams were through to the shootout. Jason Paulie would take over the lead at the end of the day from Marty Hart. Paulie's lead of 14 points was very comfortable going into the shootout. However there would be a great battle formed for 2nd. Positions 2-4 are just 10 points apart and podium finishes are crucial to championships. The real story was that of Peter Antunac. The Australian Champion made waves at Put Up or Shut Up, but that is just exhibition. He came to Vegas wanting a second chance on a course he had many problems on back at the W.E.Rock World Championships. After finding his groove, Antunac made the pass on Cody Waggoner and did not look back. Peter Antunac would be the first to take to the track. His large yellow OPW buggy was sticking the technical stuff very well, but that was half the battle. The final portion of the course was the bonus vertical from obstacle B3. Peter lined his rig up to launch it toward the sky, but time was not on the the Aussies side. As he got his rig to the top of the concrete his time was gone. Peter was just yards from the finish, but it didn't matter because his time was up. Shannon Campbell would be next up on course. The new Monster Energy Drink team looked to be poised to move up in the standings, but the tight courses got the best of Campbell. Shannon may have finished the course, but his score of 31 did not look good to help him move up from 5th. Jason Scherer is one of those drivers that has the go big or go home attitude. Things were going big for Scherer through the tight technical potion of the obstacle. 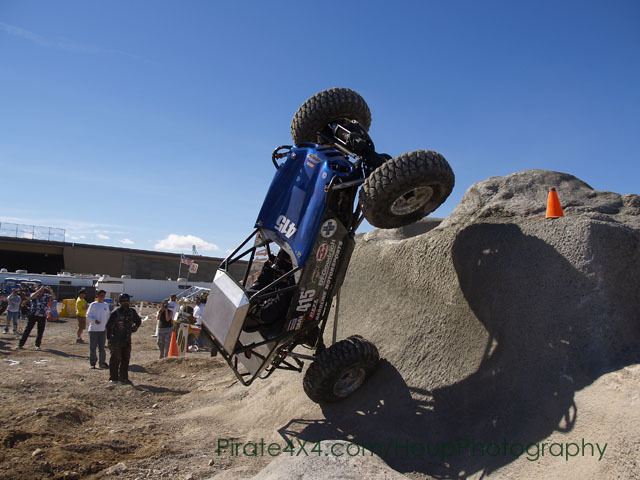 He was on fire after setting his Rage 4th moonbuggy on it's side in what looked like a concrete halfpipe. His nice recovery pumped him and spotter, Lance Clifford. They shot for the final vertical that stood between them and the finish. Scherer went for the throttle and on his side he went. After trying to get the rig back over the team called it quits. Jason Scherer was done and could not capitalize on moving up. Tracy Jordan would be next up. The winner at PUSU was looking strong and still had a mathematical chance at a win. For Tracy to keep his chance alive he had to complete the obstacle with a score under 16 points. This was a tall order considering that the lowest score on the obstacle was almost double that, but if anyone could lay pressure down it was Tracy Jordan. Jordan went through the obstacle looking smooth, but penalties were stacking against Tracy Jordan. When Jordan crossed the stripe his chances for victory were gone by 7 points. Marty Hart would be next. Hart was just 14 points out of first after leading going into the final regulation obstacle. The hired hand for Bruce Zeller had spent all weekend in catch up mode and knew that he had a rig that could win. All Marty had to do was just take a score less than 26 points to keep his chances alive for victory. Marty used everything he learned splitting the courses on the east coast and made the cleanest run see in the technical first part of the course. When Marty was confronted with the wall he scaled it like it was nothing less than a Sunday drive in the park. He dropped off the obstacle and collected a score of just 12 points. This would put the pressure on Jason Paulie. For Paulie to collect his second straight victory at the Las Vegas International Rockcrawl Arena, he would have to finish with a score lower than 27 points. This could possibly be a large order considering Shannon Campbell's run was 31 points, but Paulie knows this rig better than any person alive. 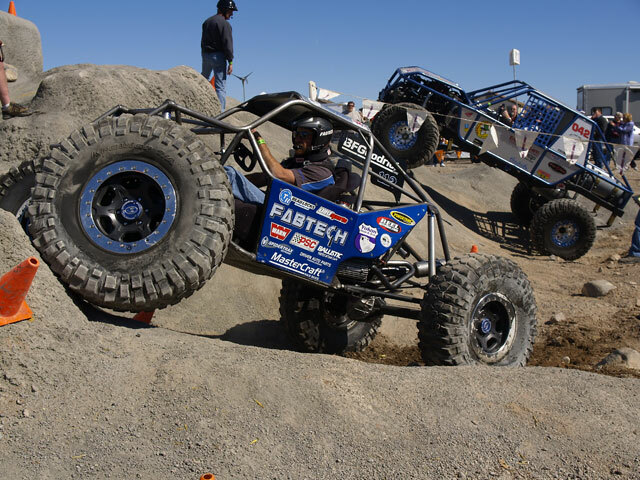 Paulie took it through the technical section without one problem, but so did Jason Scherer and Peter Antunac and they are in rigs that do not have the high center of gravity like Paulie's rig. Jason tried to throttle it to the top, but his rig was not happy. Things almost came to an end when his rig almost went the way of Scherer, but he recovered it and just used his finesse to plant his rig on top of the concrete. With time running out, Paulie drove his rig off and crossed the line. When Paulie crossed the line he has only scored 12 points and took the win by 14 over Marty Hart. Dean Bullock ripped out of the gates as the man to beat, his yellow Suzuki was hooked up and on fire from the start. Dean Bullock however was being hounded by two female competitors, Ashleigh Andrews and Becca Webster. This class would also see something very interesting when Buzz Bronsema decided to strap in. Instead of Bronsema moving up from Stock Modified, Bronsema, will be competing in both classes. Things would start slow for Bronsema as he would come in 16th with 39 points. The competition was very close from 4th place back to 13th. 12 points would separate all of these competitors. Bullock would continue lead as the scores went skywards. 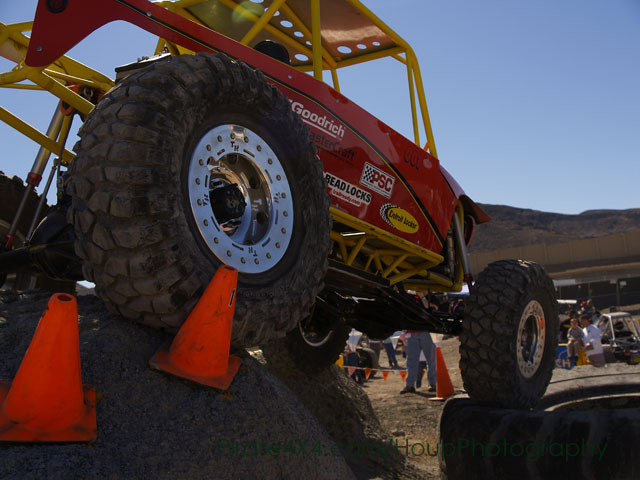 The tightness of this obstacle became a thorn in the side of the drivers in Pro Modified. The race for second was a tie going into B3 between Ashleigh Andrews and Becca Webster, but you could also not count out Brian Errea who was just 1 point behind them. The race for 5th position was still a fight that spans to the 13th position which was only 14 points behind. Bullock was running in his own zip code while the entire field started shaking up. Becca Webster and Ashleigh Andrews race was on hold for a while as high scores would be their downfall from 2nd. Becca would take 33 and would fall 6th, and Ashleigh would take 40 and fall to 7th. Tim Florian would take over 2nd after an awesome 2 point run. Many people have their hands full with many other competitors right now including a 3-way tie for 10th. Dean Bullock started to pull away from the field as Brad Lovell moved into 2nd place. Lovell would have his hands full though as a hard charging Ashleigh Andrews and Becca Webster would be right behind Lovell, but actually 2nd -7th was just 20 points, but it was anyone's race. Dean Bullock seems to be running a clinic on the courses today. The 2006 Western National Champion has picked up where he left off from last year. He currently hold an 18 point lead over Brad Lovell. Brad Lovell is in second place, but the FABTECH Ford Ranger has got a charging Ashleigh Andrews on his heels. Ms. Andrews is just 3 points behind Lovell and has been nothing short of impressive this weekend including decimating the field on B4 when she put up the only negative score for the entire Pro Modified class. Not to many points behind Ms. Andrews is the Red Bull Rockher of Becca Webster. The #88 has been battling some issues, but is still running very strong. Becca's highly competitive scores on B1 and B4 have kept her in the running just 4 points behind Andrews and 7 points behind Lovell. Mike Kensin is another driver that could move way up the standings. Coming into today's competition he is just 4 points behind Webster and 10 off Lovell. Tim Florian is sitting on the bubble for the Pro Modified Shootout, he is just two points behind Keinsen and12 off Lovell, but the 7th place rig of 2006 GNC Champion, Brian Errea, is just 10 points away. Even though Bullock may be on his own wave length the competition is extremely tight, and with courses that are tight and not so friendly to the Pro Mod rigs this class may be the one to watch today. Ashleigh Andrews was a no show for the second day of competition. This was a shock and a surprise, but added a whole new dynamic to the competition. This meant that Becca Webster inherited 3rd from the missing Andrews, and had to deal with two competitors just 6 points behind her. Hold off the competition, Mrs. Webster did and actually going into A2 she would take over 2nd. Brad Lovell would fall back to 3rd, in what had became a drag race between long time rivals, Chevy and Ford. Mike Klensin was not far off this race though and could stand to capitalize if either Lovell or Webster were to falter. Dean Bullock continued to lead, but took a damaging 24 points on this run. Becca Webster's run of 11 would give her and opportunity to start to reel in the charging Bullock. At the top of the field competition started to spread out as scores were varied across the top teams. The race to make the shootout was heated though. 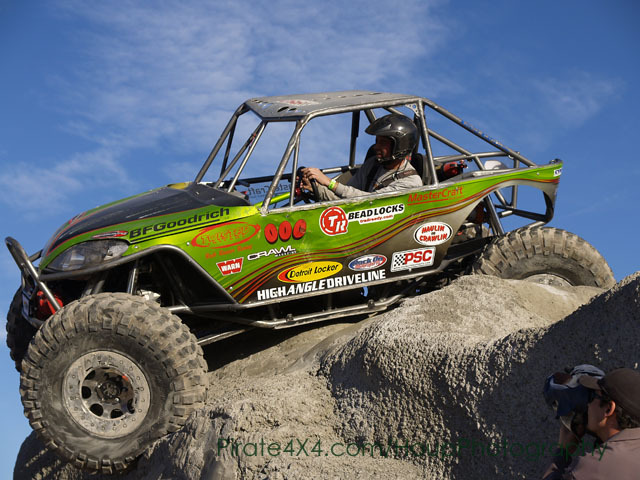 Tim Florian held onto the 6th position, but lurking just behind him was the Desertfab Motorsports team with Todd McCullen driving was just one point back and ready to capitalize if Florian was to make a mistake. Courses were tight this weekend, and A3 claimed Becca Webster. A very costly roll over would send the 2nd place driver to 4th place and would allow Brad Lovell and Brian Errea to move up onto the podium. Dean Bullock continued to hold the top spot with a commanding 22 point lead over 2nd place Brad Lovell and 39 points over 3rd Brian Errea. The top two may have had some distance on 3rd, but Brian Errea had Becca Webster and Mike Klensin within just 7 points of him. Going into the final regulation obstacle the race to the shootout looked to be going Tim Florian's way after Todd McCullen failed to complete A3. When all was said and done in the regulation competition for Pro-Modified, Dean Bullock lead the event wire-to-wire. However crossing the stripe at the end of a W.E.Rock rockcrawl is not the end of the competition. 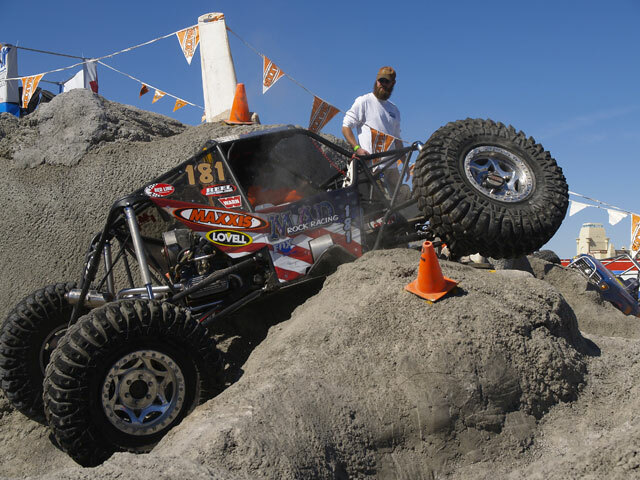 He still has to dodge the bullet one more time and Brad Lovell has his sites set on the 12 time rockcrawling champion. Lovell has made up 17 points over the final three obstacles to pull in just 12 points from Dean Bullock. This shootout field was highly competitive and close. Tim Florian survived the bullet and make the field, but 21 points off of 5th place looked like a long shot to even move up, but anything could happen. However there was a battle for the bottom step of the podium. Brian Errea held onto 3rd, but he had the Red Bull Rockher of Becca Webster just 2 points behind him and Mike Klensin just 7 points away. Anything could happen. The negative scores ran rampant on this obstacle as creative engineering came into play, but nothing much else happened. Except some controversy at the end. When the dust settled Becca Webster and Brian Errea were tied. So who would be on the podium and who would be in 4th. Brian Errea would be the winner in the tie breaker and would be on the podium. Even with a torn rotator cuff, Dean Bullock, would take another win in Las Vegas. The race for the lead is tight. Dan Patterson is leading in class, but the rig of Troy Bailey is just 8 points behind him. Buzz Bronsema is running all alone in 3rd, a staggering 54 points behind Patterson and 46 behind Bailey. After Bronsema there is quite a battle for 4th James Andrus and Eric Hackney. These teams are just 1 point apart going into today's competition. Dan Patterson started the second day of competition on the wrong foot. He did not finish C1 and handed the lead over to Troy Bailey. Going into the final obstacle Patterson was just 11 points away from Bailey. He went negative -1 on the final obstacle and left Bailey with pressure to go as close to flawless as he could. As long as Bailey could finish and run under 15 points he would be the victor. Bailey entered the course and ran smooth taking only 4 back-ups. He would sail to the victory 10 points over Dan Patterson. John James is running an almost 30 point route of the F-Toy class over Cody Deschamps. There are only two close battles for position in this class and both are 7 points separations. Cody Deschamps and Matt Messer are duking it out for 2nd, and Hobie Smith is trying to out run Mike Wright for 4th. Matt Messer retook the lead on obstacle C1. Messer was looking strong, but problems on C3 would hand the lead back to John James. From that point on John James would not look back and the team Marlin Crawlers F-Toy would go on to victory lane. Marty Hart, got the call from Bruce Zeller with an offer he could not refuse. 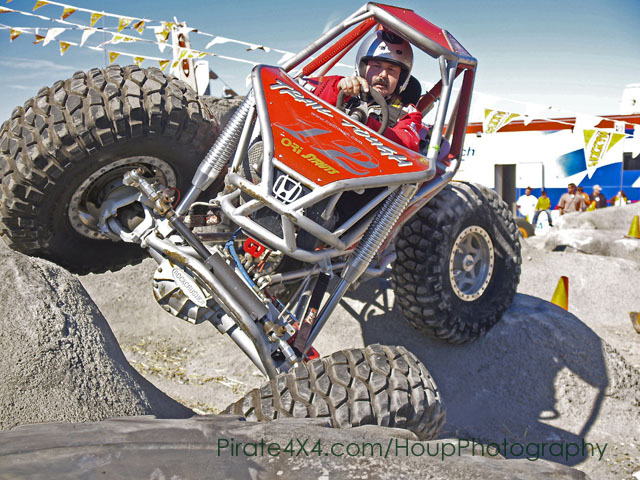 BZ offered the Ragin' Cajun a chance to take drive in the MAD Rock Racing moonbuggy. 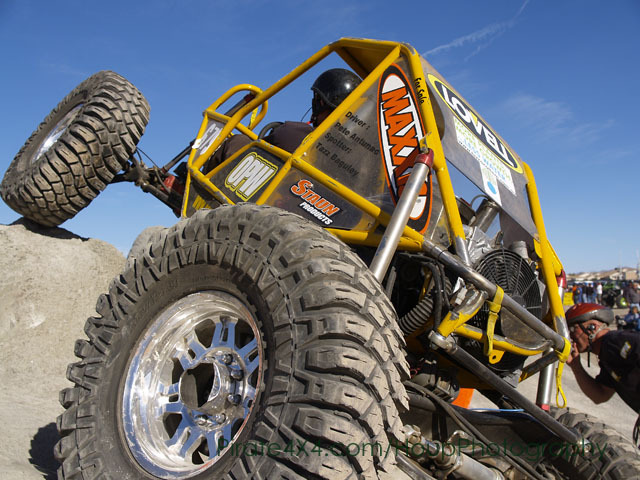 Marty has not disappointed in his first W.E.Rock West Event, showing that he can hook his Maxxis Tires up as well in the West as he can in the East. Troy Vickery of Toys by Troy was sitting in a great spot until a mishap that continued on every course. "We hit a wall with our first day, We'll pull off a great day tomorrow. 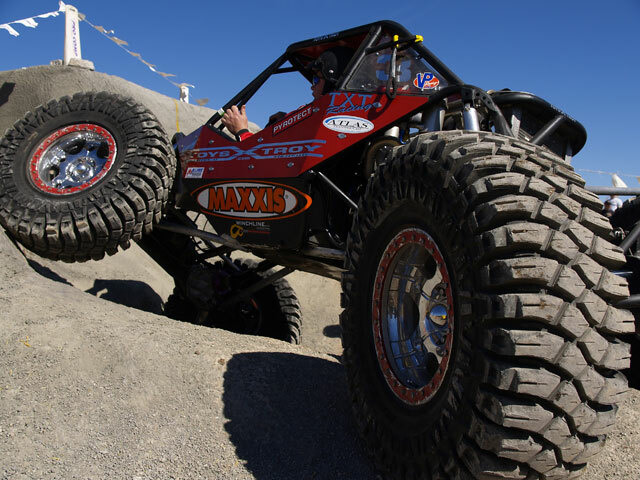 Either way the Maxxis Tires are hooking up and putting us in the spot we want, communication will be the key for us." Tracy Jordan sitting in 2nd place after day one, only 8 points behind first place Jason Scherer. The rivalry between the two drivers started at Donner Ski Ranch, What happens on day two will test the battle and the teams on an entirely new level. A4, one of the toughest courses of the event is by far the tightest and most unforgiving course on the A-side. King Pirate Lance Clifford Stated, "We cleared the drop off and missed the cone everyone else hit, then swiped the cone that no-one hit, it was gay, lol." Regardless, the duo of Jason Scherer and Lance Clifford sit somewhat comfortable in first place. Scherer when commenting about the rivalry explained, "There are a ton of drivers that are great, Tracy is definitely one of the best if not the best, but the cool thing is, anyone can take this event at anytime, we have our work cut out for us to pull through the weekend."